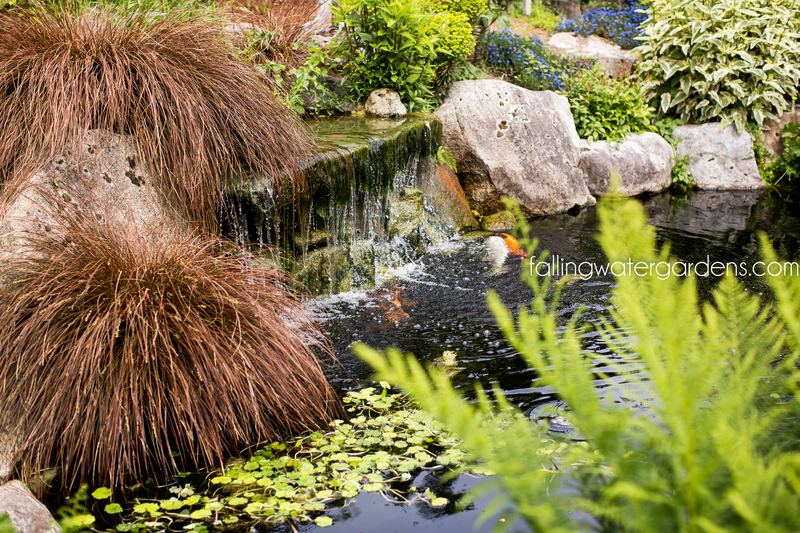 Falling Water Designs » What Is Happening To My Pond? Every time a fish breathes he creates ammonia, just like when you breathe you create carbon dioxide. Other contributors to high ammonia levels are excess fish waste from overfeeding and excess food and plant material decomposing in the pond. A large pond with only a few fish can deal with the ammonia that is created because it is changed through a chemical/biological system into “fertilizer” that the plants in your pond can use and thus eliminating the ammonia from the pond. In small ponds or ponds with a lot of fish we add a piece of equipment called a biological or bead filter. We grow beneficial bacteria on the filter media that happens to love to eat ammonia. The bacteria and the fish live happily together both taking care of the other. In winter much of the bacteria dies so every spring we need to “seed” our biological filter by adding beneficial bacteria to the pond. Falling Water Gardens sells several varieties of beneficial bacteria for you to use. You typically add the bacteria to the pond. It is then pumped through your filter and begins growing in the filter. We suggest adding the bacteria three times in a row with three to seven days between applications. It is imperative that you unplug your UV sterilizer, if you have one, during the time you are trying to seed the filter. That’s because the UV kills both algae and bacteria, which we are trying to get to grow in our filter. Once the bacteria is growing in the filter we can plug the UV sterilizer back in. A common cause of filter problems is the desire to over-clean the biological filter. Bacteria grows in a microscopically thin film. When we blast the filter with water from our tap we blow all the bacteria off the filter and we instantly kill it with the chlorine in the tap water. Now the filter has to be re-seeded for another three weeks! If you need to clean your filter during season just lightly clean the filter with pond water. What are the signs of high ammonia? Fish gasping for air at the surface and acting irregularly. How do we test for high ammonia? With an ammonia test kit purchased from Falling Water Gardens. What do we do when we have a high ammonia situation? Immediately change 1/3rd to ½ of the water in the pond to dilute the ammonia. When you do this drastic of a water change you must add de-chlorinator to the water or you will burn the gills of your fish causing irreparable damage. That’s why you should always have a bottle of de-chlorinator on the shelf for emergencies. Stop feeding your fish immediately until you can rectify the ammonia situation. feeding your fish means more fish waste that adds to the problem. Figure out if your filter is dirty or if it wasn’t seeded properly in the spring. Add a filter if you don’t have one. 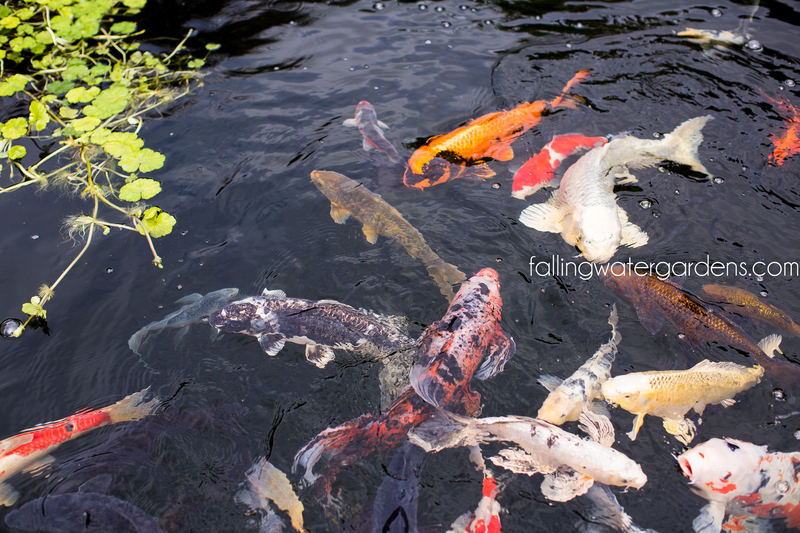 Falling Water Gardens sells many high quality bead/biological filters. Cull out the least desirable fish in your pond to get the stocking level to one the pond can support. This is common spawning behavior. When the water warms up, the fish get frisky. The males will follow the female fish around, bumping and pushing her to encourage her to drop her eggs. The males are all competing to be the one at the front and it can get rough. It is possible for your fish to be pushed out of the pond during this time. If you find a fish out of the pond, and the fish is still moving, pick him up and put him back in the pond. Keep a close eye on him. If he isn’t moving but he is still soft and slimy, he might not have been out of the pond for very long and you can put him back in the pond and then holding his tail pull him backwards through the water. This is similar to mouth-to-mouth resuscitation. It forces water across the fish’s gills and can sometimes bring a fish back from the brink. 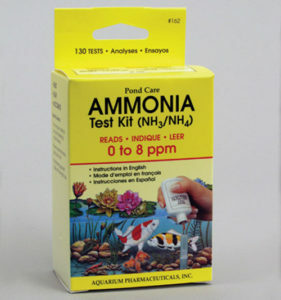 In need of an ammonia test kit? Visit Falling Water Gardens nursery in Monroe, Washington!